While MOSFETs are very rugged devices from a current standpoint, like all semiconductors, they are subject to immediate damage or destruction if the voltage ratings of the device are exceeded. The most common failure modes of MOSFETs in class E transmitters are gate puncture due to voltage spikes at the gates of the MOSFET, and drain-source (high voltage) breakdown. Gate voltage spikes are generally a result of gate overdrive. This is usually remedied by using a stable driver, and by adding protection devices to the gate circuit. You can easily protect the gates of MOSFETs by using TVS (transient voltage supressor) devices (sometimes called TransZorbs) from the gate bus to the source bus or ground plane. Try to keep the TVS lead impedance as low as possible to afford maximum protection to the gates. TVS devices work well on 75 and 160 meters without any device heating, and may work on 40 meters, although I personally have not tested this as of yet. The TVS devices are very effective at protecting the gates from any overvoltages or spikes. The primary cause of drain source failure is a parasitic oscillation in the class E RF amplifier. Another very common cause is related to poor or failing shunt capacitors (capacitors usually lose value when heated - some will momentarily fail) allowing large voltages to occur during MOSFET turn off, which would otherwise not be present if the capacitor were working properly. Shunt capacitor problems can be hard to find, and are generally intermittent in nature. Use high quality, high current shunt capacitors. Using two capacitors in parallel is much better than using a single capacitor. Parasitic oscillations come about when the MOSFETs are allowed to operate in their analog (or linear) region for a long enough time for a parasitic oscillation to get going. This region exists between the MOSFET gate threshold voltage and saturation voltage. MOSFETs have extremely high voltage gain, combined with very high capacitances, which makes the devices very prone to parasitics unless steps are taken to prevent them. In audio circuits, and switching power supplies operating below 1mHz, it is usually sufficient to insert a resistor between the gate of each MOSFET and any other components, to stablize the MOSFET against parasitics. In class E amplifiers operating above 2 mHz, this is not always practical. Even a small resistance in series with the gate will significantly reduce the gate drive, and will slow the rise and fall times of the gate waveform. Putting a 10 ohm NON-INDUCTIVE resistor from gate the source can often help. The best way to prevent parasitics is to use a gate driver circuit that guarantees the MOSFET gates are actively held in either the ON or OFF state at all times. The gates must never be allowed to "float" or be subject to a high impedance driving source. If the gate drive drops under modulation, you may also be in danger of allowing the MOSFETs to operate in their linear range, giving rise to possible parasitics. The most fool proof driver for a MOSFET is a driver IC connected directly to the gate, with short leads and good grounding and bypassing. You can protect the drains from the possibility of overvoltage caused by parasitics and other anomalies by using a TVS across the drain bus. 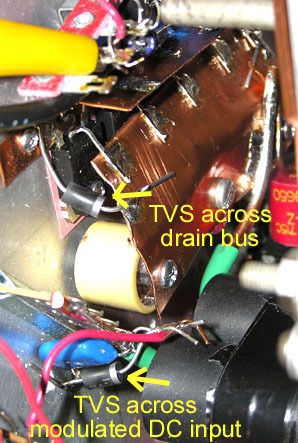 A couple of 1.5KE540A TVS devices, connected from the drain bus to the source bus has proven effective in helping to reduce or eliminate voltage spikes that would otherwise cause device failure. The modulated DC input to the RF amplifier should also be protected with 130V (1.5KE130A) TVS devices. This will prevent high voltage spikes caused by inductance in the modulator circuitry from reaching the RF amplifier. These devices should be located right at the RF amplifier, one for each module. By using a high speed current sensor such as a Hall Effect device, connected between the output of the modulator and the RF amplifier, combined with circuitry to quickly remove power from the RF amplifier in the event of an overload, it is possible to provide very effective protection against even short duration current overloads. Most of the power supplies shown here incorporate some type of overcurrent protection. These are relatively slow shut-down circuits, and will generally protect the power supplies and modulators from damage which would otherwise result from severe overload. Do not leave these important circuits out of your implementations. Although very efficient, class E RF amplifiers, and their modulators can generate a considerable amount of heat, if operated at more than a hundred watts or so. An RF amplifier operating at 350 watts will produce at least 75 watts of heat, when you factor in gate drive power (converted to heat). If you have included a driver on the same heat sink, you must conclude that all of the power used in the driver will be converted to heat, either in the gates of the RF MOSFETs or the drain of the driver MOSFET. A class H modulator, supplying modulated DC to a 350 watt transmitter will produce approximately 130 watts of heat at carrier, and somewhat more than this at full modulation. Sufficient heat sink area is essential for proper cooling of the modulator and RF amplifier. A 8 inch by 12 inch heat sink with 20 3/4 inch fins (or equivalent) equipped with a small fan should be more than sufficient for the RF amplifier. For the modulator, a similar or somewhat larger heat sink, equipped with a good fan, should work.